The 19th century saw house building on an unprecedented scale in Britain. Although glass production changed significantly in this period it was not until the turn of the 20th century that the mechanical-drawn cylinder process superseded the hand process and produced a glass sheet with far less characteristic unevenness. 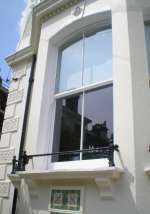 In 1845 the glass duty was repealed(it had been hiked in 1815 to pay for the war with Napoleon’s France) This removed the financial advantages enjoyed by producers of crown glass and opened the door to manufacturers of Cylinder glass who could make larger panes of glass and sash windows could be made with fewer glazing bars. 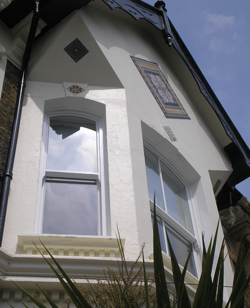 With larger and heavier sheets of glass it became necessary to modify the construction of the sashes to cope with the greater stresses imposed on their joints. So the side rails were continued down, projecting below the junction with the bottom rail, allowing the joint to be supported from below as well as from above. These ‘horns’ took on a progressively more elaborate form.